“We Bring Adventure to life” . This is our slogan and we believe that an adventurous mind is essential for all the people regardless of their ages. 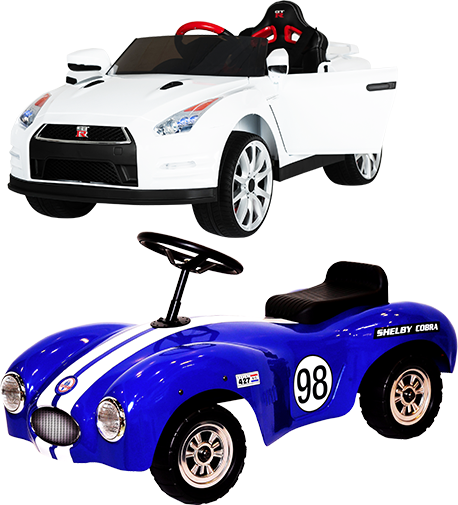 We continuously develop high quality collectable diecast, Stamped Steel Pedal Car and Battery Powered Ride on to ensure every one of you have enjoyable experiences with our products. Our goal is to exceed the expectations of every client by offering outstanding customer service, increased flexibility and superior quality. Great customer service starts with trusting your service provider. We want to make sure your experience with Beyond Infinity is a positive one. That’s why we offer limited warranty for our Ride on vehicles. We have authorized service centers that carry replacement parts, batteries, and chargers in addition to repairing vehicles in or out of warranty. For details, pls refer to the contact information on the product packaging and user manual. During the warranty period, we will repair or, at its discretion, replace any defective product provided that the product has been used under normal circumstances, solely for the purpose for which it was intended and has been given proper care and maintenance. This warranty does not cover damage caused by the customer, damage which resulted from normal wear and tear or from alterations made by the customer, or damage caused by use for an unintended purpose. This warranty policy only applies to vehicles purchased through our authorized sellers excluding liquidation centers, flea markets, and swap meets. For products purchased through liquidation centers, flea markets and swap meets, please contact our service center for technical assistance and/or parts purchases.